Jack Douglas Dinnis was always very smartly dressed. We saw that in a previous post. Even when spending a day on the beach he looked immaculate. 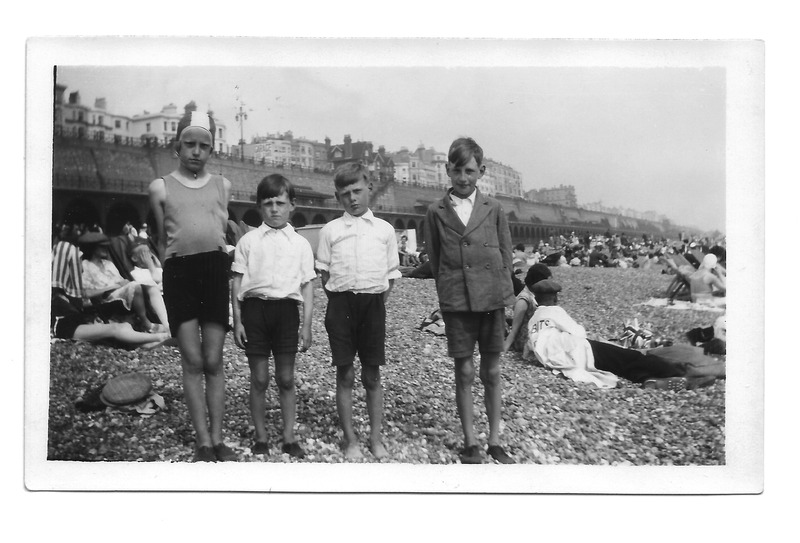 Here he is on Brighton beach on the 5th of August 1931, wearing his jacket, buttoned up. 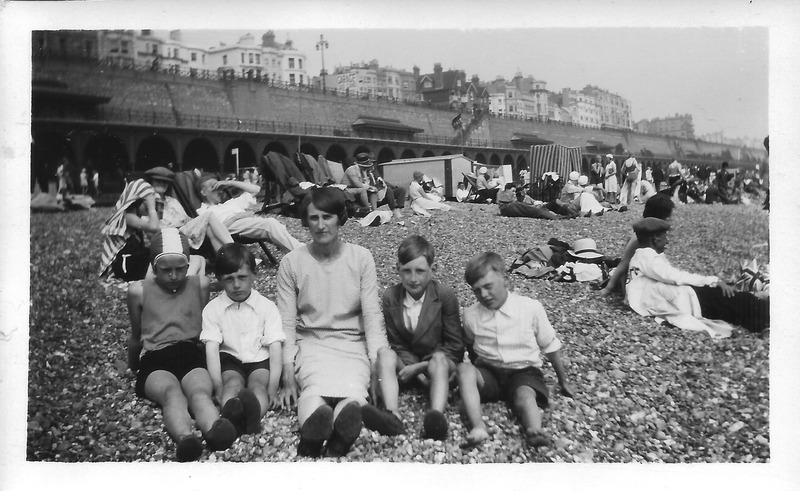 You’ll notice my father, Gordon (next to Jack) had by now kicked off his shoes and was wandering barefoot on the marvellous pebbles of Brighton beach. Nancy (left) was stripped off with her swimming hat on and ready to run into the sea. Here is another photograph of the children, with their mother, Annie Dinnis. It just seems so unusual for a little boy to be so smart! 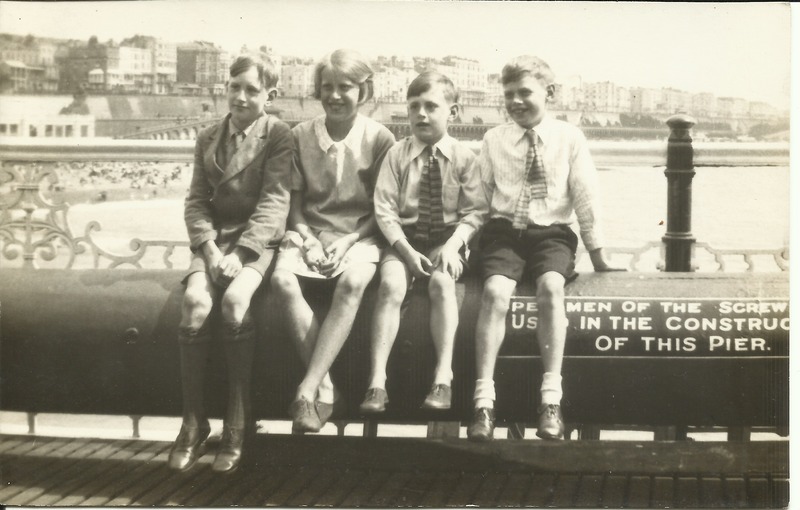 I have another photograph taken around the same time of the Dinnis children sitting on the Palace Pier. The children are all looking fairly smart here, with Ron and Gordon wearing ties even if they are a little scrappy. Jack has his knotted perfectly, and of course has his socks pulled up and his jacket buttoned smartly. 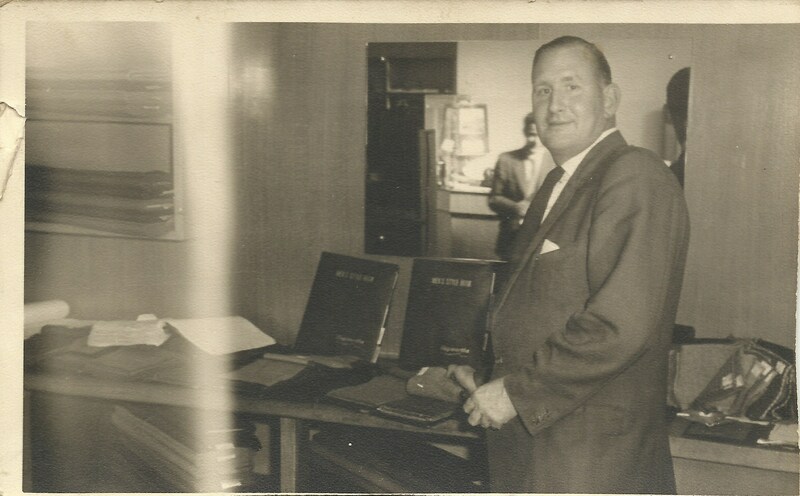 I have found a photograph of Jack as an adult, working at Hepworths gentlemen’s outfitters in Brighton. He always looked smart, and retained his sense of style. This entry was posted in Annie Cleeve, Gordon Charles Dinnis, Jack Douglas Dinnis, Nancy Dora Dinnis, Ronald Stanley Dinnis and tagged 1930s Brighton, Brighton, Brighton beach, fashion, Hepworths, old photographs, pebbles, Photographs. Bookmark the permalink. What great memories! My granddaughter turns 3 on Aug 5 which is why I was calculating timeline! Love the well dressed look but you can see how adorable the shoeless Gordon looked with his feet free in the sand!